Khwāja Shams-ud-Dīn Muḥammad Ḥāfeẓ-e Shīrāzī (Persian: خواجه شمس‌‌الدین محمد حافظ شیرازی‎‎), known by his pen name Hafez (حافظ Ḥāfeẓ; 1325/26–1389/90), was a Persian poet who "lauded the joys of love and wine but also targeted religious hypocrisy." His collected works are regarded as a pinnacle of Persian literature and are to be found in the homes of most people in Iran, who learn his poems by heart and still use them as proverbs and sayings. His life and poems have been the subject of much analysis, commentary and interpretation, influencing post-14th century Persian writing more than any other author. Themes of his ghazals are the beloved, faith, and exposing hypocrisy. In his ghazals, he deals with love, wine and tavern, all presenting the ecstasy and freedom from restraint, whether in actual worldly release or in the voice of the lover speaking of divine love. His influence in the lives of Persian speakers can be found in "Hafez readings" (fāl-e hāfez, Persian: فال حافظ‎‎) and the frequent use of his poems in Persian traditional music, visual art, and Persian calligraphy. His tomb is visited often. Adaptations, imitations and translations of his poems exist in all major languages. Hafez was born in Shiraz, Iran. His parents were from Kazerun, Fars Province. Despite his profound effect on Persian life and culture and his enduring popularity and influence, few details of his life are known. Accounts of his early life rely upon traditional anecdotes. Early tazkiras (biographical sketches) mentioning Hafez are generally considered unreliable. At an early age, he memorized the Quran and was given the title of Hafez, which he later used as his pen name. The preface of his Divān, in which his early life is discussed, was written by an unknown contemporary whose name may have been Moḥammad Golandām. Two of the most highly regarded modern editions of Hafez's Divān are compiled by Moḥammad Ghazvini and Qāsem Ḡani (495 ghazals) and by Parviz Natel-Khanlari (486 ghazals). Modern scholars generally agree that Hafez was born either in 1315 or 1317; following an account by Jami 1390 is considered the year in which he died. Hafez was supported by patronage from several successive local regimes: Shah Abu Ishaq, who came to power while Hafez was in his teens; Timur at the end of his life; and even the strict ruler Shah Mubariz ud-Din Muhammad (Mubariz Muzaffar). Though his work flourished most under the 27-year rule of Jalal ud-Din Shah Shuja (Shah Shuja), it is claimed Hāfez briefly fell out of favor with Shah Shuja for mocking inferior poets (Shah Shuja wrote poetry himself and may have taken the comments personally), forcing Hāfez to flee from Shiraz to Isfahan and Yazd, but no historical evidence is available. His mausoleum, Hāfezieh, is located in the Musalla Gardens of Shiraz. Many semi-miraculous mythical tales were woven around Hafez after his death. It is said that by listening to his father's recitations, Hafez had accomplished the task of learning the Quran by heart at an early age (that is the meaning of the word Hafez). At the same time, he is said to have known by heart the works of Rumi (Jalal ad-Din Muhammad Balkhi), Saadi, Farid ud-Din, and Nizami. According to one tradition, before meeting his patron Hajji Zayn al-Attar, Hafez had been working in a bakery, delivering bread to a wealthy quarter of the town. There, he first saw Shakh-e Nabat, a woman of great beauty, to whom some of his poems are addressed. Ravished by her beauty but knowing that his love for her would not be requited, he allegedly held his first mystic vigil in his desire to realize this union. Still, he encountered a being of surpassing beauty who identified himself as an angel, and his further attempts at union became mystic; a pursuit of spiritual union with the divine. A Western parallel is that of Dante and Beatrice. At 60, he is said to have begun a Chilla-nashini, a 40-day-and-night vigil by sitting in a circle that he had drawn for himself. On the 40th day, he once again met with Zayn al-Attar on what is known to be their fortieth anniversary and was offered a cup of wine. It was there where he is said to have attained "Cosmic Consciousness". He hints at this episode in one of his verses in which he advises the reader to attain "clarity of wine" by letting it "sit for 40 days". Samarkand was Tamerlane's capital and Bokhara was the kingdom's finest city. "With the blows of my lustrous sword", Timur complained, "I have subjugated most of the habitable globe... to embellish Samarkand and Bokhara, the seats of my government; and you would sell them for the black mole of some girl in Shiraz!" 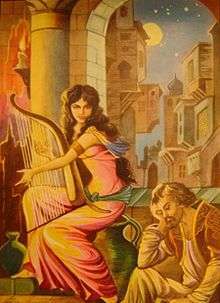 Hafez, the tale goes, bowed deeply and replied, "Alas, O Prince, it is this prodigality which is the cause of the misery in which you find me". So surprised and pleased was Timur with this response that he dismissed Hafez with handsome gifts. A couplet versified by Hafez in Nastaʿlīq. Hafez was acclaimed throughout the Islamic world during his lifetime, with other Persian poets imitating his work, and offers of patronage from Baghdad to India. :It is, by the way, rather pleasing to read dissolute old Hafiz in the original language, which sounds quite passable and, in his grammar, old Sir William Jones likes to cite as examples dubious Persian jokes, subsequently translated into Greek verse in his Commentariis poeseos asiaticae, because even in Latin they seem to him too obscene. These commentaries, Jones’ Works, Vol. II, De Poesi erotica, will amuse you. Persian prose, on the other hand, is deadly dull. E.g. the Rauzât-us-safâ by the noble Mirkhond, who recounts the Persian epic in very flowery but vacuous language. Of Alexander the Great, he says that the name Iskander, in the Ionian language, is Akshid Rus (like Iskander, a corrupt version of Alexandros); it means much the same as filusuf, which derives from fila, love, and sufa, wisdom, ‘Iskander’ thus being synonymous with ‘friend of wisdom’. 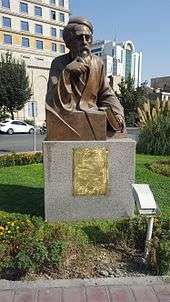 Hafez is the most popular poet in Iran, and his works can be found in almost every Iranian home. In fact, October 12 is celebrated as Hafez Day in Iran. 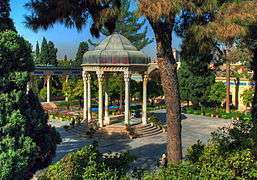 Twenty years after his death, a tomb, the Hafezieh, was erected to honor Hafez in the Musalla Gardens in Shiraz. The current mausoleum was designed by André Godard, a French archeologist and architect, in the late 1930s, and the tomb is raised up on a dais amidst rose gardens, water channels, and orange trees. Inside, Hafez's alabaster sarcophagus bears the inscription of two of his poems. His tomb is "crowded with devotees" who visit the site and the atmosphere is "festive" with visitors singing and reciting their favorite Hafez poems. Many Iranians use Divan of Hafez for fortune telling. Iranian families usually have a Divan of Hafez in their house, and when they get together during the Nowruz or Yaldā holidays, they open the Divan to a random page and read the poem on it, which they believe to be an indication of things that will happen in the future. There is no definitive version of his collected works (or Dīvān); editions vary from 573 to 994 poems. In Iran and Afghanistan, his collected works have come to be used as an aid to popular divination. Only since the 1940s has a sustained scholarly attempt (by Mas'ud Farzad, Qasim Ghani and others in Iran) been made to authenticate his work and to remove errors introduced by later copyists and censors. However, the reliability of such work has been questioned, and in the words of Hāfez scholar Iraj Bashiri, "there remains little hope from there (i.e. : Iran) for an authenticated diwan". Even libraries in Azerbaijan, Armenia, and Georgia also carry his Diwan. Many Iranian composers have composed pieces inspired by Hafez's poems or on his poems. Many Iranian singers have also performed Hafez poems. Among them Mohsen Namjoo composed music and vocals on several poems of Hafez such as Zolf, Del Miravad, Nameh and others and Hayedeh (the song "Padeshah-e Khooban", music by Farid Zoland) and Mohammad-Reza Shajarian (the song "Del Miravad Ze Dastam", music by Parviz Meshkatian). The Ottoman composer Buhurizade Mustafa Itri composed his magnum opus Neva Kâr on one of his poems. The Polish composer Karol Szymanowski has also composed The Love Songs of Hafiz on German translation of Hafez poems. Many Afghan Singers Including Ahmad Zahir, Sarban, have composed songs such as "Ay Padeshah-e Khooban", "Gar-Zulfe Parayshanat"
The question of whether his work is to be interpreted literally, mystically, or both has been a source of contention among western scholars. On the one hand, some of his early readers such as William Jones saw in him a conventional lyricist similar to European love poets such as Petrarch. Others scholars such as Henry Wilberforce Clarke saw him as purely a poet of didactic, ecstatic mysticism in the manner of Rumi, a view that modern scholarship has come to reject. This confusion stems from the fact that, early in Persian literary history, the poetic vocabulary was usurped by mystics, who believed that the ineffable could be better approached in poetry than in prose. In composing poems of mystic content, they imbued every word and image with mystical undertones, causing mysticism and lyricism to converge into a single tradition. As a result, no fourteenth-century Persian poet could write a lyrical poem without having a flavor of mysticism forced on it by the poetic vocabulary itself. While some poets, such as Ubayd Zakani, attempted to distance themselves from this fused mystical-lyrical tradition by writing satires, Hafez embraced the fusion and thrived on it. Wheeler Thackston has said of this that Hafez "sang a rare blend of human and mystic love so balanced... that it is impossible to separate one from the other". For reason such as that, the history of the translation of Hāfez is fraught with complications, and few translations into western languages have been wholly successful. One of the figurative gestures for which he is most famous (and which is among the most difficult to translate) is īhām or artful punning. Thus, a word such as gowhar, which could mean both "essence, truth" and "pearl," would take on both meanings at once as in a phrase such as "a pearl/essential truth outside the shell of superficial existence". The cypress tree is a symbol both of the beloved and of a regal presence; the nightingale and birdsong evoke the traditional setting for human love. The "lessons of spiritual stations" suggest, obviously, a mystical undertone as well (though the word for "spiritual" could also be translated as "intrinsically meaningful"). Therefore, the words could signify at once a prince addressing his devoted followers, a lover courting a beloved, and the reception of spiritual wisdom. Though Hafez is well known for his poetry, he is less commonly recognized for his intellectual and political contributions. A defining feature of Hafez' poetry is its ironic tone and the theme of hypocrisy, widely believed to be a critique of the religious and ruling establishments of the time. Persian satire developed during the 14th century, within the courts of the Mongol Period. In this period, Hafez and other notable early satirists, such as Ubayd Zakani, produced a body of work that has since become a template for the use of satire as a political device. 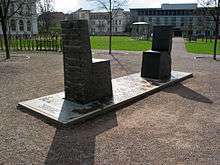 Many of his critiques are believed to be targeted at the rule of Amir Mobarez Al-Din Mohammad, specifically, towards the disintegration of important public and private institutions. He was a Sufi Muslim. His work, particularly his imaginative references to monasteries, convents, Shahneh, and muhtasib, ignored the religious taboos of his period, and he found humor in some of his society's religious doctrines. Employing humor polemically has since become a common practice in Iranian public discourse and persian satire is now perhaps the de facto language of Iranian social commentary. 1 2 3 Darke, Diana (1 November 2014). "The book in every Iranian home". BBC. 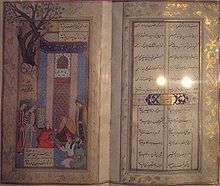 ↑ “Hafez’s Poetic Art.” Encyclopaedia Iranica. http://www.iranicaonline.org/articles/hafez-iii Accessed August 23, 2016. ↑ “Hafez’s Poetic Art" Thematics and Imagery." Encyclopaedia Iranica. http://www.iranicaonline.org/articles/hafez-iii Accessed 2016-08-23. Also Shaida, Khalid Hameed (2014). Hafiz, Drunk with God: Selected Odes. Xlibris Corporation. p. 5. ISBN 978-1-4653-7091-4. Accessed 2016-08-23. ↑ Shaida, Khalid Hameed (2014). Hafiz, Drunk with God: Selected Odes. Xlibris Corporation. p. 5. ISBN 978-1-4653-7091-4. Retrieved 2016-08-23. ↑ Shaida, Khalid Hameed (2014). Hafiz, Drunk with God: Selected Odes. Xlibris Corporation. p. 5. ISBN 978-1-4653-7091-4. Retrieved 2015-03-21. ↑ Jonathan, Bloom (2002). Islam: A Thousand Years of Faith and Power. Yale University Press. p. 166. ISBN 0-300-09422-1. Retrieved 2015-03-21. 1 2 Lewisohn, p. 69. 1 2 3 4 Gray, pp. 2-4. ↑ "Letters: Marx-Engels correspondence". Retrieved 15 January 2012. ↑ Hossein Kaji, "Hafez’s incomparable position in Iranian culture: October 12 is Hafez Day in Iran", Mehrnews. Tehran Times Opinion Column, October 12, 2006. Khorramshahi, Bahaʾ-al-Din (2002). "Hafez II: Life and Times". Encyclopædia Iranica. Retrieved 25 July 2010. Yarshater, Ehsan (2002). "Hafez I: An Overview". Encyclopædia Iranica. Retrieved 25 July 2010. Wikimedia Commons has media related to Hafez.